We went to our local beer festival in the early spring this year. I was really looking forward to it because it is always a good chance for me to try out some beers that I wouldn’t normally come across. This year’s selection came predominantly from Scotland and the North of England (along with a choice of local wines and continental bottled beers). We tried some beers from Harviestoun, Bridge of Allan, Belhaven and Caledonian breweries ~ all were interesting and varied in style and taste. One such beer was Raven Ale ~ from the brewery that brings us Dark Island (4.6% ABV), Skullsplitter (8.5% ABV) and Dragonhead Stout (4% ABV). The Orkney Brewery is based in the Isles of Orkney, just off the Northern tip of Scotland, in an old Schoolhouse. Brewing started there in 1988 (by Roger and Irene White) and since then they have produced an excellent range of bottled and cask Real Ales. They export to the mainland and also to other countries around the world (apparently they do a roaring trade in the USA!). They have won various awards for their fine products, including medals at the Brewing Industry International Awards 2002, Champion Winter Beer of Britain 2001 and Champion Beer of Scotland 2000. Raven Ale weighs in at 3.8% ABV and is made using malted barley, hops and water. Looks wise it is a pale golden colour with a little hint of orange; it has the appearance of a Pale Ale. The aroma is pretty hoppy, with a hint of citrus and a floral tinge. The texture in your mouth is light and lively; very refreshing and smooth too. There’s also a little bit of spiciness in there that makes your tongue tingle! It would go down really well with food too, because it has isn’t too overpowering and wouldn’t dominate the taste of your meal. 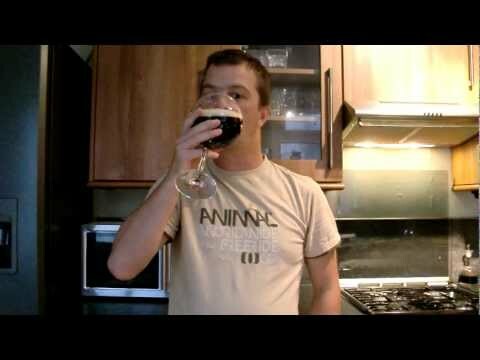 There is enough flavour and interest in there to make it good to drink on its own too! Taste wise Raven is quite a complicated little number. It is rich, fruity and has a tastiness that is perhaps unusual in a “session” beer of this relatively low strength. The initial flavour is lemony (from the hops) and this is balanced by a pleasant light maltiness (I have heard from my brother, who lived in Scotland for many years, that it used to be very malty, but has since mellowed into a much better beer). It can have the tendency to be a little on the dry side, but this is cut through nicely by the other flavours ~ fruity and buttery. The finish is refreshing and light, leading to a citrus after taste that lingers smoothly in your mouth. Altogether, a well balanced and tasty beer that is well worth a try. We paid for our beer at the festival using tokens that we purchased on entry, but expect to pay anything from 2.00 to 2.60 a pint. I have since this on rare occasions as a guest beer, but the only downside is that it is only on RARE occasions. The other Orkney beers seem to pop up more often than Raven ale; more’s the pity! The up side is that you can buy 500ml bottles online ~ from http://www.beers-scotland.co.uk/orkney.asp for around 30 for 12 bottles. If you do see it in your local then I thoroughly recommend that you sample some ~ it’s tasty, easy to drink and makes an excellent choice for an afternoon or evening drinking session. Drinking coffee in Ethiopia is not a small thing. It is something to be cherished, a time to sit down and relax. They love their coffee, and they also love their way of preparing it. It is a whole ceremony, which they enjoy sharing with foreigners. A lady will dress nicely and sit down on a small stool, with a small charcoal burner. Some incense is burning close-by to ward off the bad spirits, and grass is put on the floor, possibly a symbol of fertility. First she will wash the coffee in water, and then roast it slowly on a big iron plate on top of the charcoals. The ensuing aroma will be whiffed close to the face of the guests, everybody has to enjoy it! Then, it has to be pounded into a fine powder. This is usually done by a servant girl outside since it makes quite a lot of noise! While the coffee is being prepared, a so-called coffee-breakfast is served. This can be bread or cookies, but often roasted grains (kollo) or pop-corn are served. What is very important is for a guest to be well taken care of. Sometimes tea is even served while you wait for the coffee. While the coffee is being pounded, the lady will be boiling the water on the charcoal. Usually a clay-pot, called jevena, is used. This looks like a gourd with an extra spout. It gives a very good, distinctive flavour to the coffee. The coffee powder is put into the boiling water, and it will all boil together until the coffee is thick and dark. She will pour some out to check and then pour it back again. When it is black enough, she will remove it from the fire and let it stand on a small ring, for the coffee to set. Then, the cups will be washed in front of the guests and the coffee will be poured. Traditionally small cups without an ear are used, you balance it on the saucer! Usually coffee is drunk with sugar and no milk. After the first cup of coffee has been drunk, the cups are gathered, more water added to the pot and a second round is boiled, later a third! The first cup is called Abul, the second Tonna and the third Beraka. The last one, Beraka or Blessing, is very weak. Now you understand why you should consider your schedule when someone asks you if you would like a cup of coffee! You might be stuck for an hour or two. By all means, say yes. Especially during the rainy season this is a very pleasant way of spending an afternoon with friends! It seems a long time ago now when I was first handed a glass of dark beer in a beer festival in Lincoln by a friend who was trying to persuade me into the virtues of real ale . The dark beer was Theaksons Old Peculiar . It was very good , dame good . And back then it was under threat of diapering . “So what said I the power of the market will decide the way things will go , if a brewery is swooped up by a bigger firm then so be it .” Mrs Thatcher was in power and then greed was good, or so we thought . ” But if we do not support them then no one will make beers like this any more and all we will have to drink is larger .”My friend protested. He was a passionate about real ale , I was to young to listen and we was both slowly getting drunk . Needles to say the out come of the discussion was that we both thought we was right and both in the long run was wrong . Not wrong that the Theaksons brewery was taken over by the Big company . Scottish and Newcastle have it now . But thank good for people like my friend who went out made a stand and gave a opportunity for the small independent brewer to start once more . For now we have the Black Sheep brewery. If you go to Masam in North Yorkshire you are in for a treat. One the drive there is threw some of the best British countryside that you get around . Rolling hills and tree lined roads till you come to the town sitting just on the side of the bottom of a hill. Two it is one of the prettiest little market towns with a cobbles square and surrounding buildings and shops . If you come in from the east side of town and over the bridge you look up to your right hand side and you see The Black Sheep brewery . It is important because it hold on to a tradition that has lived in the town for generations and now despite the big breweries still does . A Paul Theaksons , of the Theaksons family opened the brewery back in the early nineties . He had decided not to go with the old firm and work for Scottish and Newcastle but to go it alone and make his own home brewed beer in his own town like his family before him . This was keeping a tradition alive in the town that had been there for generations . Now they produce a number of beers . Good solid beers that hold up to scrutiny, full of flavor and depth . The most common one and by that I mean the main beer that is brewed is the Best bitter . Light gold in colure and not to heavy in flavor . A refreshing and dry hop taste to it . It has a ABV of 3.8 and is very, very drinkable. The next is a Black Sheep Ale , A little darker than the bitter and more of the malt in this one . Slightly sweeter to the taste but not to much . It is by and large my favorite beer that they produce and the one I would pick if I had to over all . 4.4 ABV also stronger than the bitter . Black sheep Emmerdale , good light beer good flavors and a clean bitter sweet taste. I must admit that I did not like it as much as I thought I was going to but it was still a good honest drink . Plenty of flavor and a more cosmopolitan flavor to it , not as hoppy as the black sheep ale . Having said that it was 4.2 ABV so it did have a punch to it that you might not expect . Then the Riggwelter. So called after the stretcher that was used I believe to carry sheep found on the fell side who was about to give birth ot a baby lame. At 5.9 ABV you could say that it should come with a stretcher of its own . But unlike most strong beer of this king it is not over sweet . It is in fact , to my mind ,one of the best balanced beer of this kind and strength .Well worth a drink if you can get it . If you can not get to a pub or bar that you can supply you with the beer I know that you can get the Ale , Emmerdale and Rigwelter in bottles as well as a couple of other beer that they now do in bottles as well . I recommend them all and would drink them all as well with out hesitation . In a way it was a shame for the big company to take over Theaksons the way that it did and now what you drink called Theaksons is in fact brewed in Carlisle or some such place .But if it had not happened and we would not have the Black sheep that we have now , keeping the tradition going from strength to strength. 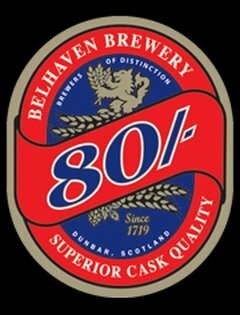 Belhaven Brewery is situated on the banks of the Firth of Forth in the Royal Burgh of Dunbar – 30 miles or so east of Edinburgh. Originally founded by Benedictine monks around 1415, the present brewery was built in 1719. It’s the largest regional (and independent) brewery in Scotland, and is one of the oldest in Britain. They brew a wide range of beers, among them: 70/-, 80/-, Burns Ale, St Andrews Ale and Wheat Beer. They’re pretty easy to come by in Scotland – apart from appearing as guest ales in many pubs, they have a large network of tied houses, but I’m not so sure how easy they are to find in the wider world. However, that’s not my problem, is it?! Most supermarkets should stock a choice of bitter in strength. A 90/- is up there with a barley wine and usually comes in around 8% ABV. Generally, these beers are called Strong Ales or Scotch Ales, but in the civilised world, we call them Wee Heavies. 90/- pours a deep, brownish crimson colour which, although dark, is crystal clear. It’s topped by a generous two fingers of lumpy, chunky off-white foam that lasts forever and laces the glass beautifully. The aroma is a little earthy and woody, but a roasted grain tone dominates. There’s plenty of fruit – raisins and plums and all sorts of dark vinous tones, but also something a little lighter too, apples maybe. It’s dark and toasty, with some toffee sticking around, but not a lot of hop presence. Very nice. There’s very little carbonation and it has a thick and creamy mouthfeel. The taste is all about malt – dark and toasty, biscuit and toffee, chocolate and fruit, nuts and raisins – no wonder it’s been described as chewy! It’s very rich but not too sweet, the heavily roasted malt manages to give it an edge of bitterness. Again. practically nothing from the hops, although there’s a faint oiliness in the background. It finishes smooth and sweet with a soft, warming aftertaste. This isn’t a beer for slaking yer drouth, but rather a sip-n-savour job. The 500ml bottled version is widely available in supermarkets (it is around here anyway), and should set you back around £1.75 or so. Best bet for finding the draught version is a Belhaven pub. Would I drink it again? – I pity the fool that tries to stop me.